London is heaven on earth for those who simply adore sights, monuments and history. At the British Museum, Westminster Abbey and the Tower of London you will discover the country’s rich history and numerous remnants from the past. Moreover you should pay a visit to Buckingham Palace, Windsor Castle and Hampton Court. In case you are allured by the endless shopping malls and street markets of London, visit them and enjoy your shopping. The streets of London are always filled with people visiting the museums, the art galleries as well as the shops. 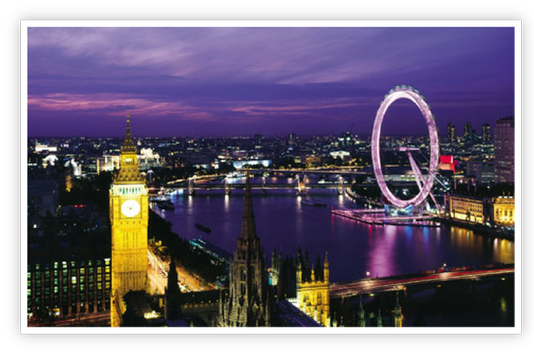 Book now your air tickets to London and experience its cosmopolitan flair. The above mentioned airlines land at the airports of Heathrow, Gatwick and Luton (more information below) which are London’s main airports. When making plans for a holiday trip to London it is better to make a reservation as soon as possible in order to find cheaper air tickets. Many airlines promote cheap flights and announce special air ticket offers for reservations made 1 or 2 months prior the departure. The airports that provide their services to London are Heathrow, Gatwick, Luton and Stansted and they all have modern equipment and comforts. You can find many shops, ATM machines, cafeterias, storage room for luggage, travel agencies and of course ticket desks for air tickets in all these airports. Heathrow Airport is enormous. It has 5 terminals and facilitates thousands of people travelling from and to London daily. It is situated 23 kilometres from the centre of London and there are of course many transport lines from the airport towards the city’s centre. The Heathrow Express train is the fastest way to get to the centre of London. There is every day service from 05:00 till 23:45 and the tickets cost approximately £16.50 to £23, depending on the type of purchase (the cheapest is from the internet). The journey from the airport to London lasts 15 minutes and the final stop is at Paddington Station. The journey from the airport to London by Tube,London metro, lasts more or less 50 minutes and the final stop is at PiccadillyCircus Station. There are frequent schedules from 05:00 till 23:45. On Sundays and national holidays the service begins later and stops earlier. There are many Tube stations at Heathrow airport and the ticket costs £4.50. The National Express Coach offers many services during the day form the airport to London’s centre and the final stop is at Victoria station which is the central bus station. The journey roughly lasts 40 to 90 minutes depending on the route and the traffic. The buses are modern and the journey is comfortable. The coaches begin their schedule at 05:30 and finish at 21:30. The ticket costs £5. The night bus Ν9 runs from Heathrow to London with final stop at Trafalgar Square and the service begins at midnight and stops at 05:30. The journey lasts 65 minutes and the ticket costs £2. The famous London taxis are also located outside Heathrow airport. In case you choose a taxi, negotiate the price of the journey before you enter the car. Have in mind that prices vary from £40 to £70 up to central London. Gatwick Airport is a modern European airport, the second in size in Great Britain, which is located 45 kilometres from central London and has 2 terminals. The Gatwick train runs from the airport every 15 minutes and the journey lasts 30 minutes, without stops, to central London and the terminal is at Victoria station. The ticket costs £16.90 the train service starts at 05:00. The Thameslink train departs from Gatwick and its terminal is at London. There is a train every 30 minutes. The ticket costs £9.80. Southern whose train ticket from Gatwick to central London, Victoria Station costs £8.90, has service every 15 minutes and operates during the night every hour from 01:00 to 04:00. The National Express coach runs every hour to Victoria’s central station. The journey lasts approximately 45 to 60 minutes with many in- between stops. The ticket costs£6.60. Make sure you choose one of the legal taxis outside the airport and have in mind that the journey from Gatwick to the city’s centre can cost up to £70. Luton airport mainly serves low budget flights and it is situated 51 kilometres northwest of London. It is actually an airport that evolves and modernizes very fast. Luton airport is connected with the train station First Capital Connect by a bus whose ride lasts 8 minutes. At the First Capital Connect train station there are regular schedules during the day as well as during the night, to many central areas in London. The ticket costs £10.90 and the route lasts 50 minutes. EasyBus offers low cost buses from Luton airport to London with many in-between stops at central parts of the city and has a 24 hour service. The ticket costs £2. Green Line 757 from Luton to Victoria with in-between stops to central areas of London every 15-20 minutes during the day and every half an hour during the night. The ticket costs £11 and the journey lasts 1 hour 15 minutes. There are always available taxis outside the airport. Make sure you negotiate the price before you enter the car because the journey might cost up to £80. Stansted airport is a busy airport that serves many low cost European flights. It is located 64 kilometres from London but there are plenty means of transport from Stansted in order to travel comfortably and easily towards central London. Stansted Express train runs from 05:30 with final stop the train station at Liverpool street in London. There is a schedule every 15 minutes during the day and every 30 minutes during the night and the early morning hours. The journey lasts 45 minutes and the ticket costs £19. Easy Bus runs regular services from Stansted to London every 20-30 minutes and the terminal is at Victoria Station. The ticket costs £2. National Express bus operates 24 hours a day from the airport to Victoria’s central bus station. The journey costs £10 and lasts 1 hour and 40 minutes. The famous London taxis are located outside the airport and can transport you to central London or wherever you wish. The journey can cost up to £80 so make sure you negotiate the price before entering the car.